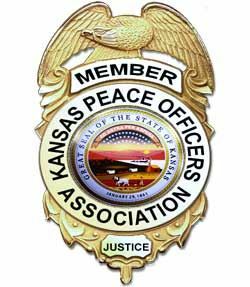 KPOA Works for You and for the betterment of all law enforcement in the state of Kansas. When you maintain your membership on a paid basis, with new members being added month by month, we are making progress! Our goal, of course, is 100 percent membership throughout Kansas. By maintaining your annual membership, you help sustain the state's largest professional law enforcement association. KPOA was founded in 1916 and continues today as an umbrella association representing all facets of the law enforcement profession. Your annual membership dues of $20 provide all the items listed below, and much more. Remember, KPOA works for you! Maintains a professional legislative liaison at Topeka during legislative sessions. Maintains an active role in all legislation affecting law enforcement. Assisted in passage of mandatory law enforcement training legislation. Supported establishment of the Kansas Law Enforcement Training Center. Continually works to improve KPERS and KP&F retirement programs. Up to five $1,000 college scholarships awarded each year to qualified dependents of KPOA members. An annual conference held in the Fall includes the KPOA business meeting, training, hospitality room with the opportunity to network with other officers from throughout the state, police supply vendors displaying modern law enforcement equipment and typically some type of social entertainment or event. Committees of the KPOA are engaged in projects throughout the year that help improve law enforcement and its delivery of services to the public. Active Member - $20.00 (USD) Subscription period: 1 year, on: January 1st No automatically recurring payments The following persons shall be eligible as Active Members: All Police Officers, Sheriffs and Deputies, Town Marshals, Constables, Prosecuting Attorneys, Coroners, Judges of Municipal, State and Federal Courts, Enforcement Agents of State and Federal Agencies and Departments, Wardens and Correctional Officers of State and Federal Institutions, Railway and Express Special Agents and Special Offices, Security Officers, Utility Special Agents and Special Officers, all Military Police Agencies, Executive Staff and full-time Instructors of the Kansas Law Enforcement Training Center, Members of Kansas Law Enforcement Reserves, part-time Officers, retired and pensioned Officers holding Active membership at the time of retirement or any full-time employee of a Law Enforcement Agency. Any Active Member may retain their membership when they leave the Law Enforcement field. Senior Life Member - $120.00 (USD) Subscription period: Unlimited Any Active Member, who shall have served the Association for ten years and be age fifty-five (55) or older and retired from active police duty; or have been a member at the time of suffering a debilitating physical or mental condition which precludes further employment as a peace officer, is eligible. The fee shall be equivalent to five (5) years dues. Members must file a letter with the Executive Committee no later than July 1 of the current year. A Senior Life Member shall have all the rights and privileges of the Active Member. Supporting Member - $20.00 (USD) Subscription period: 1 year, on: January 1st Automatic renewal (recurring payments) Any individuals, who support, financially, the program of this Association shall be eligible for selection as Supporting Members. No death benefits shall be allowed Supporting Members. They shall not hold Office nor vote at meetings.